How to make an IDC ribbon cable with two IDC connectors. 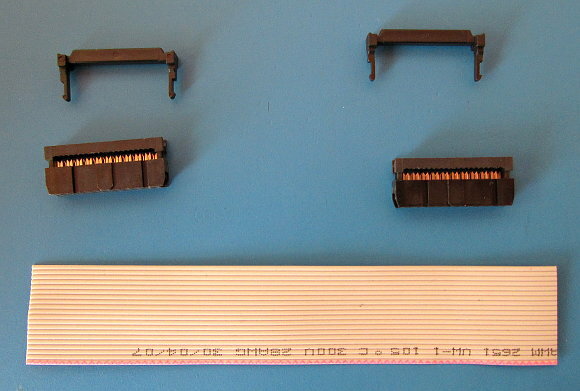 In this article two 20-way IDC female connectors and a length of 20-way flat ribbon cable are used to assemble a cable with an IDC connector at each end as shown in the image below. This same method can be used to assemble a cable of any standard size, e.g. 6 way, 10 way, 14 way, etc. To make the cable, a length of flat ribbon cable with the desired number of wires and two matching cable-mount IDC connectors are needed. The IDC connectors may come with or without strain relief. 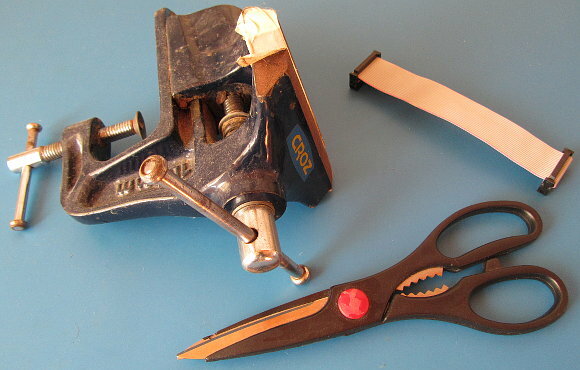 A pair of scissors is needed to cut the cable and a vice is needed to attach the IDC connectors to the ends of the cable by crimping them on. Cut a piece of ribbon cable to the desired length. If strain relief is going to be used on the IDC connector, compensate for this by making the cable slightly longer. This is because the cable is doubled back over the top of the IDC connector before the strain relief clamp is inserted which uses up some of the cable length. Before assembling the cable, identify pin 1 on the IDC connector. This is normally marked by an arrow or triangle on the IDC connector as shown in the image below. The triangle looks rather faint in the image, but can be seen on the left of the connector under the red wire of the ribbon cable. The red wire on the cable must line up with pin 1 of the IDC connector. After cutting the ribbon cable to the desired length and finding pin 1 on the connector, decide which way the cable must face. Pin 1 must always line up with the red wire of the cable, so the cable can either go into the connector from the pin 1 marker side of the cable or from the opposite side. If strain relief is being used, it will turn the cable back 180 degrees, so compensate for this. Insert the cable into the IDC connector between the body of the connector and the plastic clip. 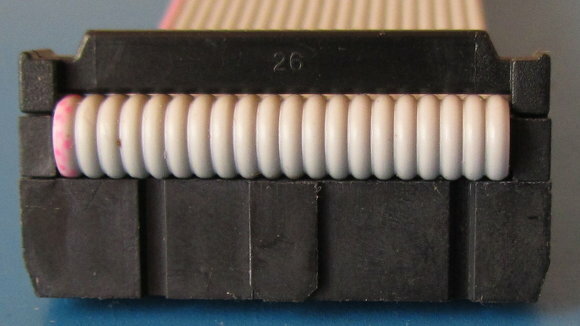 Line up the end of the ribbon cable with the body of the connector so that it does not stick out past the body of the connector. Push the top clip down as hard as you can with your fingers so that it starts to clamp the cable. Now insert the connector into the vice and tighten the vice to crimp the connector to the cable. If strain relief is being used, double the cable back and insert the strain relief clip. The video below shows the whole procedure of assembling the cable.